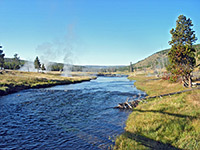 The main trail in Yellowstone's Midway Geyser Basin is the 2.4 mile route alongside the Firehole River and across new growth woodland to Fairy Falls, where a small stream tumbles 197 feet at the edge of a plateau, its waters spreading out near the base creating a pretty, feather-like effect. The trail also passes the edge of the extensive run-off channels and depositional terraces from Grand Prismatic Spring, and a fine elevated view of the area can be had by climbing a little way up the adjacent, lightly wooded hillside. 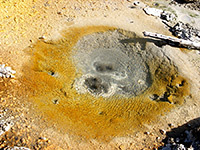 Rather fewer people continue past the falls, but just half a mile further are two energetic backcountry geysers (Spray and Imperial), this latter a large feature next to a beautiful, steaming blue pool, surrounded by sinter deposits and brightly-colored algae. All the route is level and easy; the first half is along the old Fountain Flats Drive, now open only to horses, cycles and hikers, while the second part traverses flat land beneath a line of cliffs, an area completely burned in the 1988 wildfires. 20 views along the trail to Fairy Falls and Imperial Geyser; gallery, slideshow. Fairy Falls, Spray Geyser and Imperial Geyser (mp4; 1:28 min; 27 mb). The trailhead for Fairy Falls and Imperial Geyser is at the south end of Fountain Flats Drive, a gravel track which meets the highway 5 miles north of Old Faithful. Parking is limited and RVs are not permitted, so they, and other vehicles arriving after the lot fills up, have to be left on the wide verges bordering the highway. 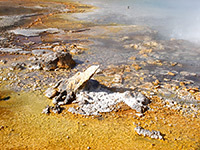 There are several hot springs nearby, including deep blue Tide Pool next to the parking area, and Till Geyser on the far side of the main road, while to the north, lining the Firehole River, are many more vents and pools. 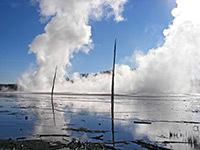 The trail follows the old road, across the river on a wide bridge then northwards along the west edge of the valley, past a few small, unnamed springs then on towards the center of Midway Geyser Basin - the land to the east changes from white, grassless earth to vast, waterlogged terraces, as the huge steam plume from Grand Prismatic Spring approaches. Several hiker-made paths climb a short distance up the hillside, for a good view of the spring, high enough to see some of the wavy run-off channels and colorful algae rings around the huge pool at the center. Stark dead trees are dotted around the edge, with a few still standing out on the terraces, casting straight shadows on the undulating, multi-layered surroundings. The path arrives at an intersection on the far side of the Grand Prismatic Spring run-off basin; the old road continues north for another 3 miles, to a parking area at Fountain Flats, while the trail to Fairy Falls heads off westwards. A bike rack and horse hitching post are provided at the junction, because this route is for foot travel only. The land is now covered by bushes and new growth pine woodland that in some places is sufficiently tall to completely enclose the path, but for most of the way gaps in the trees allow long distance views over the surroundings. Grey cliffs line the trail to the south, and the location of the falls is visible some way off, as a dark, vertical cleft. 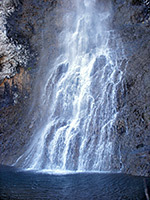 The last section climbs slightly over a bouldery slope to the good-sized pool at the base of the falls, which are in shadow most of the day since the cliffs face north and the rocks curve outwards at either side. A log-filled stream (Fairy Creek) flows downhill from the falls, and the path follows beside for a short distance before veering off towards Imperial and Spray Geysers, their position evident from two steam plumes at the far side of the valley. A half mile walk through more low woodland and over a grassy flat reaches a T-junction with the Fairy Creek Trail, from where the right fork stays close to the creek and rejoins the Fountain Flats Drive after 2 miles, while the left fork turns west and runs next to the warm stream that flows from the two geysers, which is lined by rocks bearing plentiful algae, colored yellow, orange and brown. Spray Geyser is closest - small but continually active, it produces water jets a few feet high accompanied by a lot of steam. 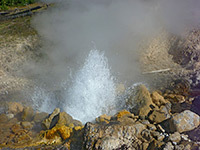 Nearby Imperial Geyser is more impressive, erupting vigorously for a minute or more, followed by a short period of calm. Next to the vent is a pretty, turquoise pool, enclosed by terraces and white sinter formations. 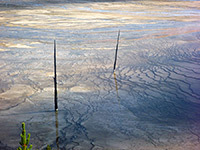 A few mud pots are located to one side but there are no more thermal features further along the path, as it begins a lengthy traverse of the high country to the west, eventually reaching the Little Firehole River, Mystic Falls and Biscuit Basin. The two geysers sit a little way up the hillside and so the views are quite extensive, back down the valley towards the steam clouds from Grand Prismatic Spring and other nearby pools.